Ira Jones' biography of Britain's top scoring ace of World War I has become the subject of some controversy over the last few years, most notably as it is the source of the claim of 73 "kills" for Mannock, thereby making him the number one scoring Allied Ace of the war. Unfortunately, due to sales rights restrictions, we cannot offer King Of Airfighters for sale in your country. Ira Jones' biography of Britain's top scoring ace of World War I has become the subject of some controversy over the last few years, most notably as it is the source of the claim of 73 "kills" for Mannock, thereby making him the number one scoring Allied Ace of the war. Later research has thrown serious doubt on this claim and indeed Mannock himself only claimed 51 kills. Jones' biography is nevertheless an important account, especially when seen in the context of the time in which it was first written. 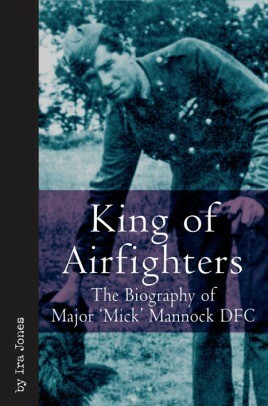 In particular, the biography really gets into the mind of Mannock, the author having been a flying comrade, and portrays the singular nature of his character and the incredible stresses that these pioneer airfighters were under in the last few months of the war by a man who flew in the thick of it. Originally published in 1934 by Ivor Nicholson and Watson in London, this aviation classic has been reprinted many times, yet each time has been reproduced from the original 1930s version of the book. This new edition has been entirely reoriginated. Not a word has been changed, but the original type and page layout have been reworked, as has been the format in which the book is presented, to give a beautiful new treatment for this classic of aviation literature. Ira Jones enlisted in 1913. When the war began, he transferred to the Royal Flying Corps and joined 10 Squadron as an air mechanic. In July 1915 he was sent to France and by January 1916 he was flying combat missions as an observer. He was then posted to 74 Squadron in early 1918, where he developed a close bond with his flight commander, Mick Mannock. In just three months he scored 37 victories flying the S.E.5a.